Targeted Age Group:: Appropriate for all ages. Writing cozy mysteries is our passion! There is no better feeling than crafting a whodunit that you feel will keep your audience guessing until the very end! And when the story involves a dessert shop serving pies, tarts & cupcakes, it is even better! “And the coconut flour,” Faith Franklin said, pouring the avalanche of white powder into her favorite mixing bowl, the one her Grandma Bessie sent all the way from Florida. It was one of those large heavy traditional ceramic bowls, creamy colored on the inside and a gorgeous shade of delicate teal on the outside. And Faith’s mom, Diana, had bought her matching wooden and teal spoons and whisks and measuring cups until the set was complete. Faith blew out a stream of air and turned the brownie mix – gluten free and vegan, especially whipped up for her mom’s dietary preferences – a little too vigorously. Of course she wanted to use her passion for baking to make a living. She couldn’t imagine anything better than kneading and mixing and measuring all day, working in a room filled with the warm, sweet, comforting smell of baking. Living in her ditzy floral apron. Discovering new treats and making everyone feel warm and fuzzy inside. In fact, she’d whiled away many hours daydreaming about it, ever since she was little. At seven years old she even made a shoebox model of just how her very own bakery would look. Faith’s Special Treats, she’d called it. And she’d designed numerous menus over the years, which her mother had kept to whip out and embarrass her with on special occasions, in the most affectionate way. Extending the embarrassment further – and probably a factor in her breakup with Jeremy, she thought – were Polaroid pictures Faith had snapped of when she’d decorated the kitchen table with tinsel and random ornaments and made her mom sit down for a feast of poorly raised cakes and too-hard cookies. Her sandy hair was scraped back into pigtails and freckles covered her nose and cheeks. Enthusiasm shone so bright in her eyes and her gap-toothed smile dominated the shot as she held the camera. “Don’t you look so… powerful?” her ever-empowering mother always said, looking down at the album proudly, while Faith hid her head in her hands. Faith’s baking skills had improved vastly and the two pigtails of course were long gone, her hair now always in a long messy ponytail of wave-straight-curl-tangle that took a lot of effort and time to tame. Time Faith would much rather use creating a brand new recipe, like peanut butter chocolate gateau, or raspberry and white chocolate brioche casserole. That was always a favorite when her friends came over. Her own favorites were cupcakes, and some days she made rows and rows of them, all in different flavors. The dusting of freckles was still there too, and her love for baking, of course. But her confidence, that absolute conviction that she was going to own her own vastly successful café or bakery? That had dwindled away over the years. Now it was hanging by a thread, and could snap off at any moment. After all, what did she know about marketing or decorating or health and safety paperwork? She could bake, sure, and had a sense of the aesthetic. But what about everything else? It was much easier not to face up to the practicality. She could keep her dream just that, a dream. “Not bad,” Dianne said with a weary smile, putting her glasses down on the page. “It’s a passionate young writer, you can tell that much. They’ve got a good story, but they have to learn a bit about the craft. It’s not really my thing, though. It’s time travel romance.” She walked over to the fruit basket and picked up a banana. “I know, mom, I know.” At 24, Faith knew it was The Right Time to move out of their apartment. Heck, it had probably been The Right Time an awful long time ago, but everything seemed to conspire against Faith when it came to jobs. When she had tried to join her mother in fiction editing she felt lonely and bored witless and ended up making so many mistakes she wasn’t allowed to carry on. Then working in a store as a sales assistant made her feel all pushy and salesy, and she ended up telling the clients to go across the street because there was an awesome blouse in there that was just their color. That hadn’t gone down well. Eventually she’d snagged work as a cashier in a grocery store, but the hours weren’t regular enough for her to move out. Her mom always talked about moving into a little cabin in a more rural area of Minnesota, “my writing and editing cabin by the lake,” she always said. Faith really wanted her mom’s dream to come true – they got on so well and, if a little unorthodox, her mother had always been super supportive. But it looked like her mom’s dream was in Faith’s uncertain and slightly fearful hands. “As soon as your brownies are in the oven I’ll go look for jobs on the iPad,” Faith said. “I’ll just get anything, not even baking related.” She felt her heart sink, but put on a brave smile. “Anything will do, as long as it has better hours than where I’m working now.” Faith pretended to herself she was one of those people who could handle working in a dead end 9 to 5 she hated with a passion. But she knew she wasn’t. It was Grandma Bessie. Faith rushed to the hallway and took the phone – Grandma Bessie always asked to speak to her. Though Bessie was somewhat finicky and difficult to please, she had a good heart, and their shared love of baking held them together. Faith picked at the lace on the edging of her bedcover – she liked everything super beautiful, with soft colors and lace and pearls and trimmings. “Old lady style,” her mother teased her. “It’s shabby chic!” Faith always protested. “Good to hear,” Grandma Bessie said. Faith gazed out the window, where the creamy blue sky heralded the beginning of summer. It was too cold in Minnesota, she’d always thought. She remembered catching a commercial about Jamaica when she was little, and had begged and begged her mom with pleas and long lists about why visiting there would be a great thing to do. She’d even taken her small self into the travel agents and picked up a brochure, then spent hours designing their ideal itinerary in her room. Of course they didn’t have the money to go, and Faith soon gave up on it. She wondered about where she might have A New Start, dreaming of beaches and green palms swaying in the breeze, but she already knew it was just another dream. “No,” Grandma Bessie said. “The cat’s mother.” She even tittered at that, and it took a lot to make Grandma Bessie laugh. “Me? Are you… are you sure?” Faith said. Her dream hurtled toward her, and already her mind was ticking over with just how beautiful it would look, and the creations she would serve up, and the specials blackboard she’d place out the front. The last time they’d visited her tea room had been five years before – Faith’s mom didn’t like to travel much – and Faith had redesigned it all in her mind then, too. It had been dated, in all truth, and the regulars were mostly elderly people who had been coming there for “donkey’s years” as her mother said – slang she’d picked up from her student days in England, that meant ‘forever’. And the place was too dark and dingy. Grandma Bessie was proud for sure, and she’d never even allowed Faith to so much as look at a baking utensil on their last visit, so this was a shock for sure. In fact, when Diana had suggested Faith come to apprentice with Grandma, Bessie had looked like someone had just killed her cat, and Faith had quickly changed the subject. It finally sank in for Faith. 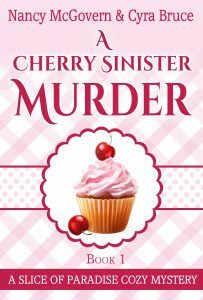 Free Book in this same series called "The Cream Pie Alibi".